+QUEBICI, empresa especializada en servicios integrales en pruebas por etapas, dispondrá de material y soluciones para cualquier bicicleta. Si estás interesado en recibir un servicio a la carta, debes reservarlo con antelación, descargando y completando el formulario disponible en la pestaña “Servicio Mecánico” de la página web oficial (aquí). ¡Servicio completo y libre de preocupaciones! Tras cada etapa se entrega la bicicleta y se recoge al día siguiente antes de la salida en perfecto estado: lavada, revisada y ajustada. 25% de descuento en recambios. Bono válido para todos los días. Reparaciones gratuitas y 20% de descuento en recambios. Bono válido para tres días. 15% de descuento en recambios. A partir de tres reparaciones, cada hora se cobra a 35 € y los recambios mantienen el descuento. Sin contratación previa pero sin la garantía de poder recibir el servicio ni disponer de recambios. Recambios sin descuento. SRAM (through its distributor Team Bike), will continue supporting Andalucía Bike Race, being the official technical service of the race. 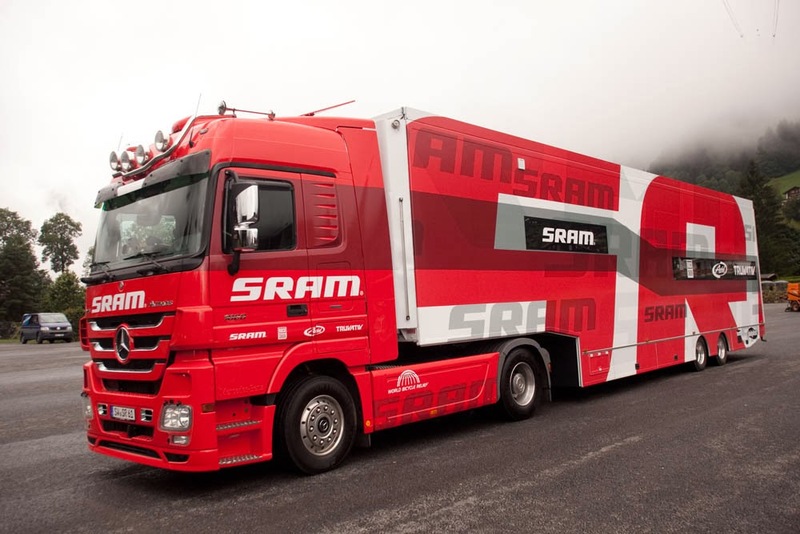 All the participants with components form the SRAM corporation (SRAM, RockShox, Avid and Truvativ) will have the same service as the World Cup competitors, thanks to the attendance of its European race and event truck. The official SRAM truck will be located at the two main venues, IFEJA (Jaén) and Rabanales campus (Córdoba), skipping Andújar. It features a fully furnished and stocked professional workshop, with suspension tuning equipment, a hospitality area with a meeting room and kitchen and a 40 m2 viewing deck on top of the trailer. It takes almost four hours to build with a team of four people, covering a surface of over 100 m2, where four custom built rolling workstations provide a comfortable working environment for SRAM’s race technicians. Five SRAM/Team Bike technicians will offer free technical support (spare parts will be charged). This service will be offered both half way through each stage (at the second aid station), and at the paddock. +QUEBICI, a company specialised in offering full service at stage races, will have equipment and solutions for any bicycle. If you are interested in having a customized service, you must hire it in advance, downloading and completing the form available in the “Mechanical Service” tab of the official website (here). Full service and free of worries! After each stage the bicycle is delivered and is collected the next day before the start in perfect condition: washed, checked and serviced. 25% discount on spare parts. Voucher valid for all days. Free servicing and a 20% discount on spare parts. Voucher valid for three days. 15% discount on spare parts. After three services, each hour is charged at 35 € and the spare parts maintain the same discount. No need to hire it previously but with no guarantee of being able to receive the service neither having spare parts. Spare parts with no discount.